In the past, Revy had always been steadfastly adamant about not sharing her pigloo. It mattered not how roomy the pigloo was or what startling noise was occurring nearby, if there was a pigloo and she was parked in it no visitors were allowed. No "safety in numbers" huddling for this obstinate pig. 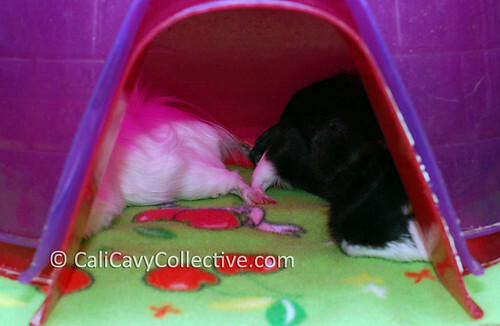 Which is the reason why our human was astonished to see Revy and Abby-Roo snoozing together in the same pigloo yesterday after cage changing. In the midst of shuffling bedding from room to room our piggy mom had forgotten to return two houses to their cage so evidently the cagemates had agreed to share the lone pigloo. They weren't exactly cuddling side by side - rather, each was flopped down in opposite corners as far away from each other as they could get - but the funny thing was that they were sleeping foot to foot! What a cute photo! I love that!